Banana Stem Chutney| Vazha Pindi Chammanthi| Vazhai Thandu Thogayal is an easy to prepare healthy fibre and nutrient rich chutney/ thogayal which could be used with idli dosa with tempering and without to match with rice. I am eager to add banana stem in one or other way in my meal. One such new trial is this chutney recipe which came out really well. Banana stem has many health benefits which i have mentioned in my Banana Stem Juice recipe earlier. It is good for kidney stones, to controls the blood pressure, reduces body heat and detoxify the body. I have already shared many banana stem recipes in my page Vazhai pindi pachadi(Kerala style), Vazhai thandu moor kootu(Tamil style), Banana Stem Juice, Vazhai thandu Paruppu Kootu, Vazha pindi Thoran/ Poriyal. Cut the banana stem in to roundels and pull the fibre using your fingers. Then chop them and set aside. Heat oil in a pan and add half a teaspoon of oil and roast urad dhal, dry red chillies, tamarind together till the dhal starts to get golden colour. Now add the ginger and asafetida and just cook for fifteen seconds and transfer into a plate and allow the mixture to cool. To do tempering, in the same pan heat oil and splutter the mustard seeds and add the curry leaves and turn off the flame. Once the mixture cools down add this along with chopped banana stem and grated coconut and pulse thrice to make a powder(to grind the urad dhal) then add some salt and water and grind to make a fine paste. Add the tempering and mix well and serve with Idli or dosa. You could prepare this same preparation as a thogayal/ Chammanthi without tempering to match with rice. 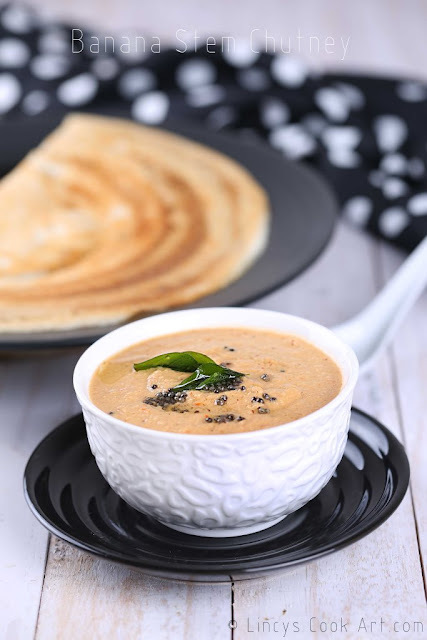 Vazhai thandu chutney sounds healthy and delicious..